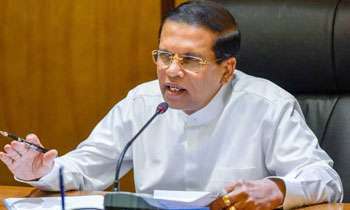 President Maithripala Sirisena who hurriedly summoned a special Cabinet meeting today criticized the move to arrest high profile military officers even without initiating court action against them. The President summoned this meeting in the event of moves by the Criminal Investigation Department (CID) to record a statement from Chief of Defence Staff Ravindra Wijegunaratne over the incident in which 11 students were abducted during the war time. He was asked to give a statement to the CID last Monday. However, he had gone to Mexico the same day. Also the CID had informed court earlier that they would arrest the CDS. .
Let's talk about cashew nuts instead!!! Must be worried that the son inlaw will not get comissions for the bucket of bolts recomended . President stop police to protect criminals.people die daily with high crimes.remove sirisena and punish him for protecting criminals.only job he is doing properly is protecting criminals. Let do the police its work without political influence. The times for a dictatorial rule is over. Do not protect murderers and their helpers. Don't blame the politicians for everything. Gas, Diesel and Petrol is going up worldwide. The Indian Rupee is at the lowest. So, you can't always blame everything on politicians. You must dissect the uncontrollable from the Controllable and make them accountable for the latter. Repeat of what happened to FCID! CID can close the files on the 11 students and other high-profile cases He only says the law should be applied justly and impartially; But, in some cases a little differently!!! Cashew nuts are more important to the president than 11 students going missing. However when his son breaks the law the IGP is asked to hide the tapes. Yahapalanya my foot!!! protecting the corrupt and the criminals ....this guy is no better than Rajapaksas ....same crap,just different name..! Why didn't Prime Minister and the Cabinet return fire? Don't yjey have a spine to take on this guy?